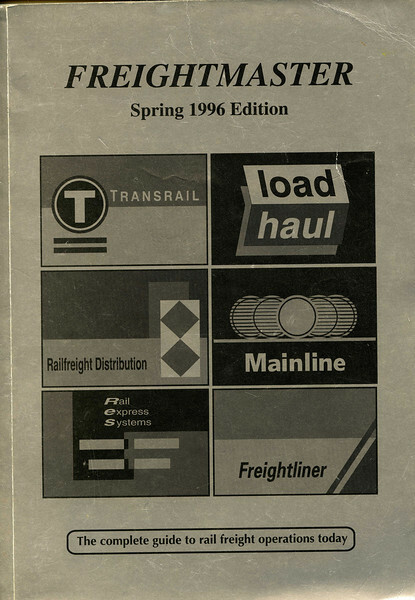 In 1996 I first came across Freightmaster, I can't remember precisely where, but it was early in the year as my first copy of the quarterly timetable was that for Spring 1996. It has been an invaluable resource ever since. The pictures I've selected show scenes which are unlikely ever to be repeated, either the trains don't run, the motive power has gone to the great engine shed in the sky or the infrastructure has changed completely. Here's the cover to the Spring 1996 edition. I would thoroughly recommend anyone with an interest in railfreight in this country to either subscribe to the on-line service or, at the very least, buy the occasional book. Of course the fact a train is listed in Freightmaster doesn't mean it'll run (who said the railways were that predictable) and its perfectly possible to be surprised by something NOT in the timetable. But by and large Freightmaster is an invaluable resource, realigning the odds in the enthusiasts favour!